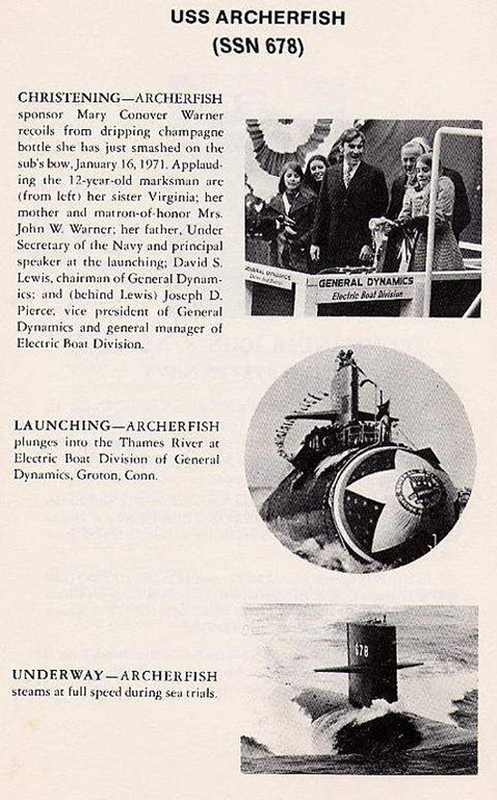 Sturgeon Class Attack Submarine: Laid down, 19 June 1969, at the Electric Boat Div., General Dynamics Corp., Groton, CT.; Launched, 16 January 1971; Commissioned, USS Archerfish (SSN-678), 17 December 1971, at New London, CT.; Decommissioned and simultaneously struck from the Naval Register, 31 March 1998; Final Disposition, disposed of through (NPSSRP) the Nuclear Powered Ship and Submarine Recycling Program at Puget Sound Naval Shipyard, Bremerton, WA., 6 November 1998. 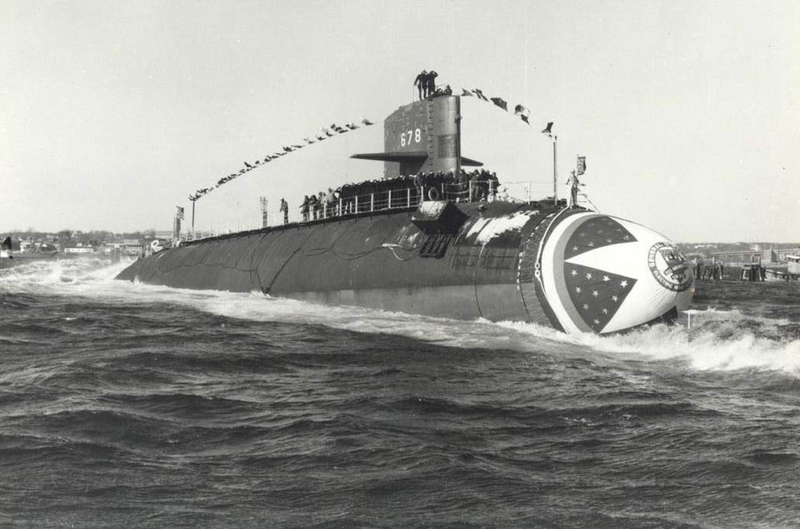 Specifications: Displacement, Surfaced: 3,640 t., Submerged: 4,640 t.; Length 302'; Beam 31' 8"; Draft 28' 8"; Speed, Surfaced 15 kts, Submerged 25 kts; Depth limit 1,300'; Complement 108; Armament, four 21" torpedo tubes amidships aft of bow, MK 48 Torpedoes, UUM-44A SUBROC, UGM-84A/C Harpoon, MK 57 deep water mines, MK 60 CAPTOR mines; Combat Sensors, Radar, BPS-14/15 surface search, Sonars, BQQ-5 multifunction bow mounted, BQR-7 passive in submarines with BQQ-2, BQS-13 active 7, TB-16 or TB-23 towed array, EW Systems, WLQ-4(V), WLR-4(V), WLR-9 ; Propulsion System, one S5W nuclear reactor, two steam turbines, one propeller, 15,000 shp. 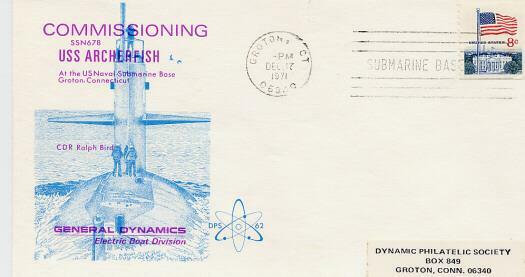 21k Commemorative post card marking the commissioning of the Archerfish (SSN-678), 17 December 1971. Courtesy of Richard Leonhardt. 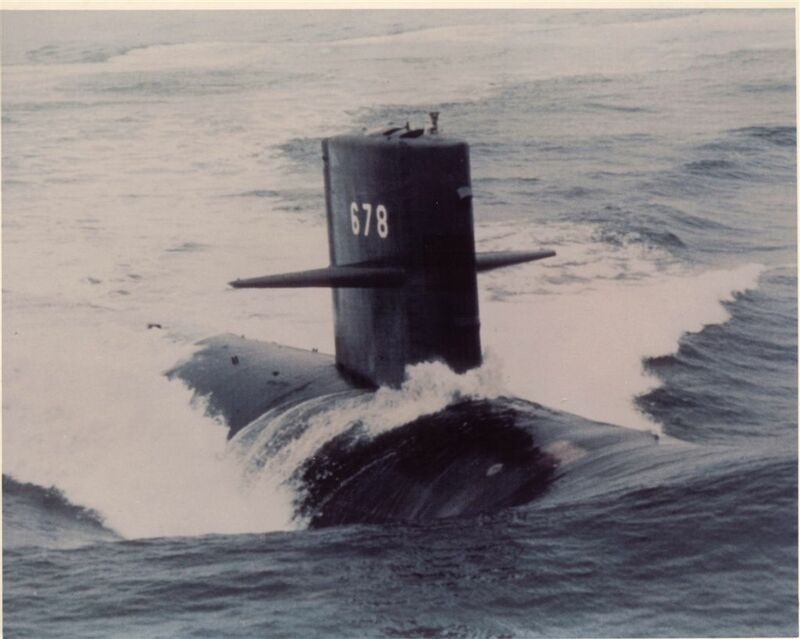 86k The Commanding officer in the cockpit of the Archerfish (SSN-678), possibly during her sea-trials off the New England coast, 1971-72. Official USN photo courtesy of Wendell Royce McLaughlin Jr.
476k Near the North Pole. 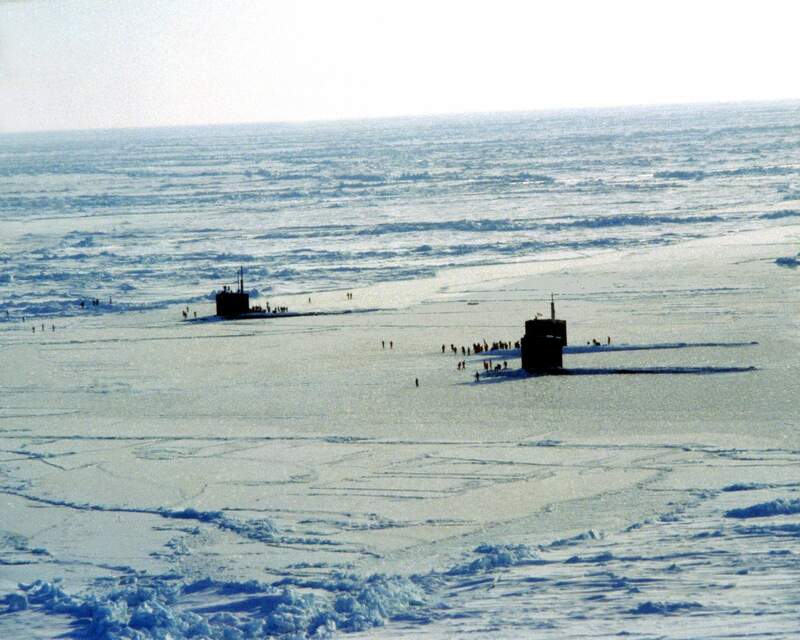 This is probably the only photo ever taken of a submarine surfaced through the polar ice and helicopter in the same picture. If my memory is correct, the photo was taken by ET2 Phil Darrow and we were on an expedition to chart a course through the polar cap in ICEX 79. The chopper was from a support team that I believe came from an outpost in Greenland. USN photo by ET2 Phil Darrow, courtesy of Allan Koenig, Archerfish 1976 - 80. 802k The expanse of endless waste seems to engulf the Ray (SSN-653), Hawkbill (SSN-666), and & Archerfish (SSN-678) during ICEX 86. 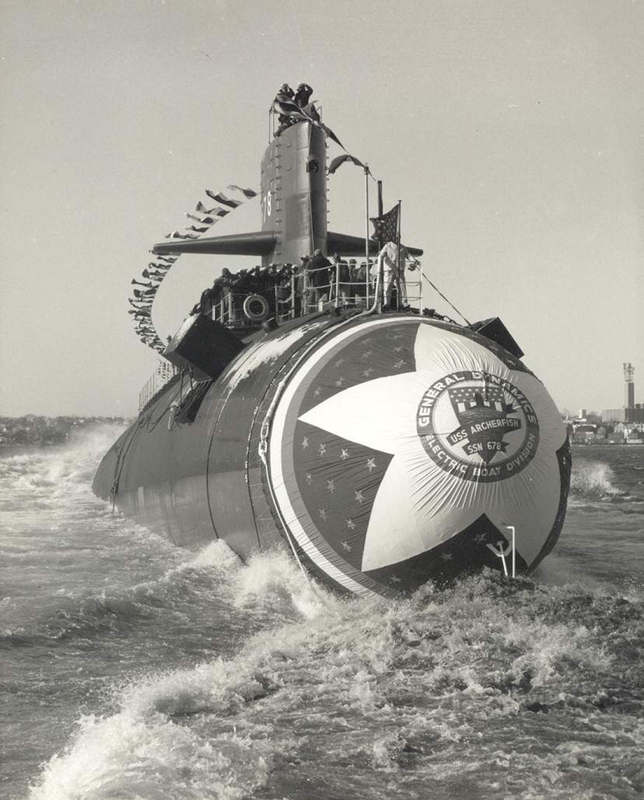 Official USN photo # DN-SC-86-07409, from the Department of Defense Still Media Collection, courtesy of dodmedia.osd.mil. Photo i.d. courtesy of John R.V. Jones, STS1/SS, USS RAY (SSN-653) '81 - '86 COMSUBRON 4 Staff '86-'88. 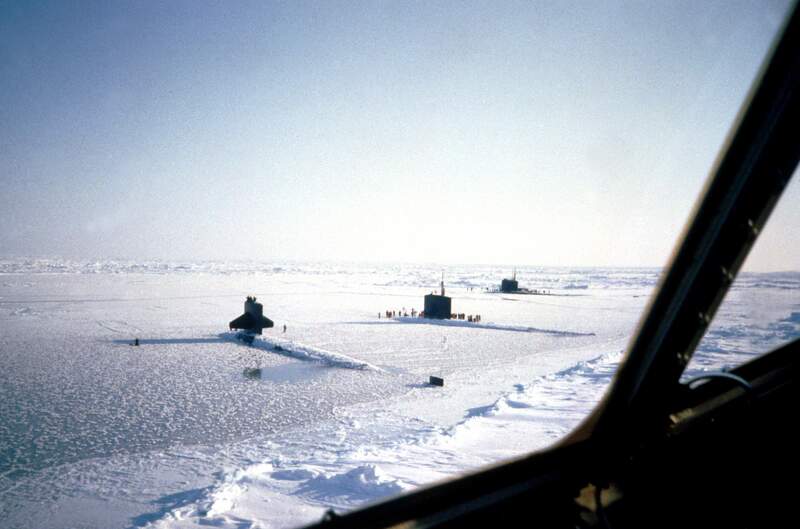 441k An elevated view of the attack submarines Ray (SSN-653), Hawkbill (SSN-666), and & Archerfish (SSN-678) surfaced at the geographic North Pole, 6 May 1986 during ICEX 86. 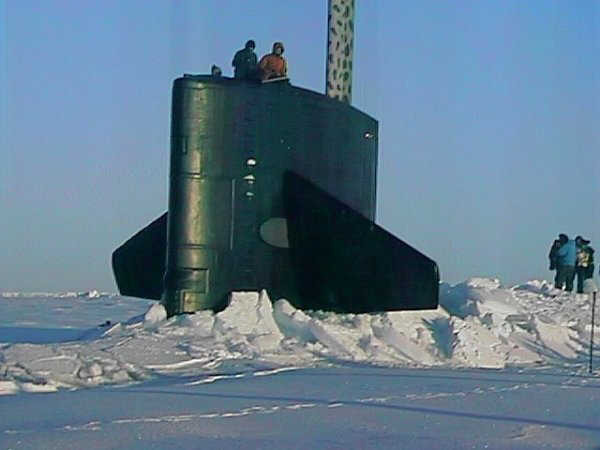 This is the first time three nuclear-powered submarines have simultaneously surfaced at the pole. Official USN photo # DN-SC-86-07408, from the Department of Defense Still Media Collection, courtesy of dodmedia.osd.mil. 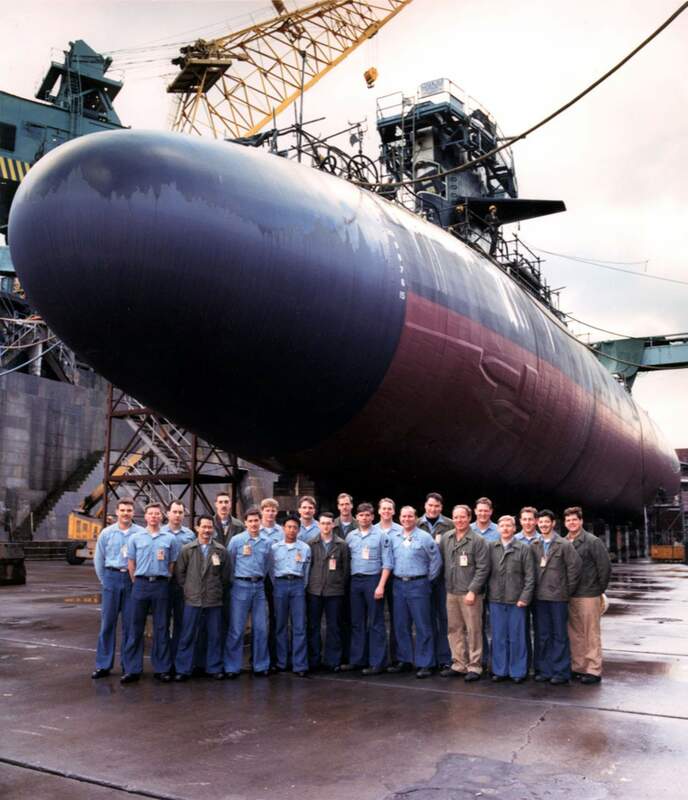 211k Weapons Department photo of the Archerfish (SSN-678) while in a refueling overhaul in Bremerton, WA (~1989). Photo by Eric Herman, FTG1 (ss/dv). 162k Voyage to the bottom of the tub. 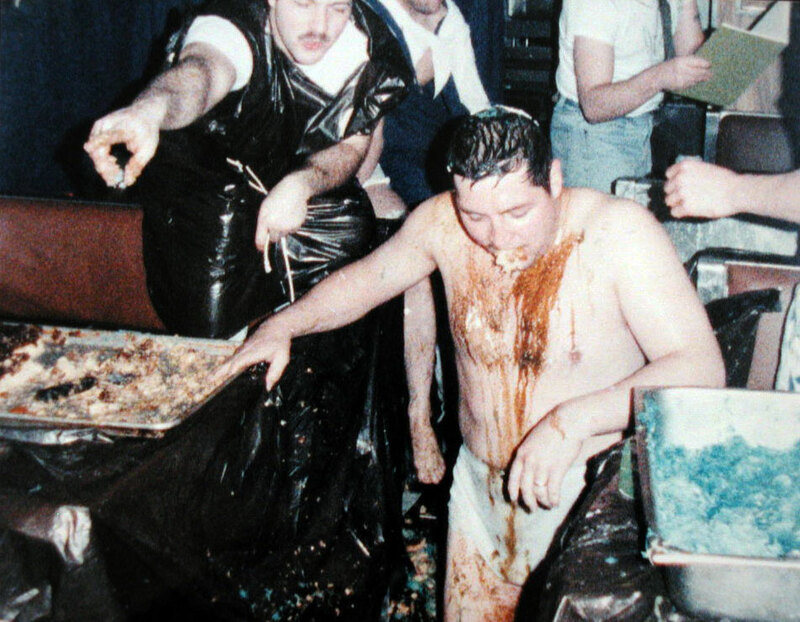 "Bluenosed" during Icex88. Photo by Eric Herman, FTG1 (ss/dv). 322k SDV logo created James Raab as a general T shirt design. Photo i.d. via MMCM/SS/DV Banas. Photo by Eric Herman, FTG1 (ss/dv). 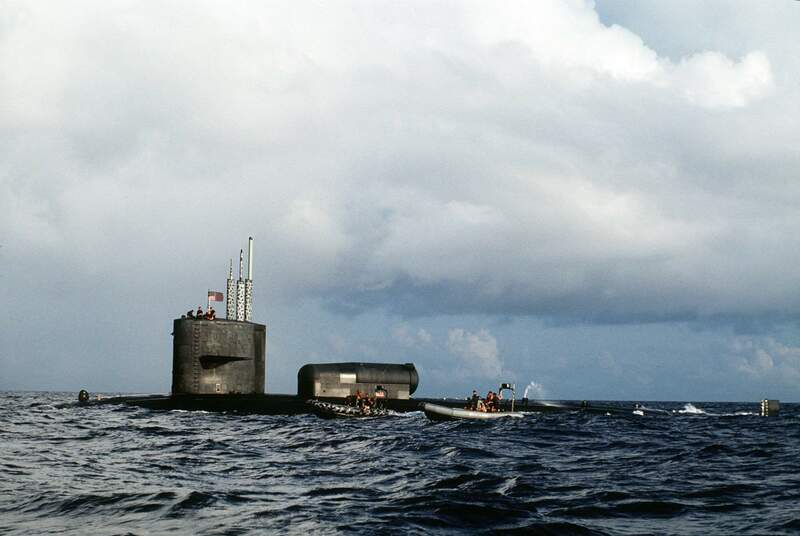 235k A pair of rigid-hull inflatable boats from Special Boat Unit 4 (SBU-4) operate alongside the nuclear-powered attack submarine Archerfish (SSN-678) during the joint service exercise Ocean Venture '93, off the coast of Puerto Rico on 5 May 1993. The Archerfish has a dry deck shelter attached to its deck. 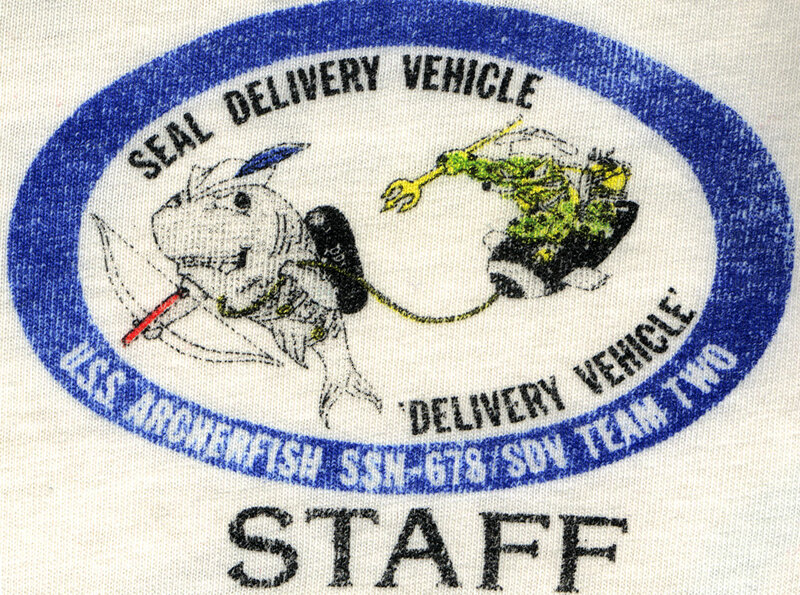 Official USN photo # DN-ST-93-05192, by PH2 (DV) Glen Hurd, from the Department of Defense Still Media Collection, courtesy of dodmedia.osd.mil. & submitted by Bill Gonyo. 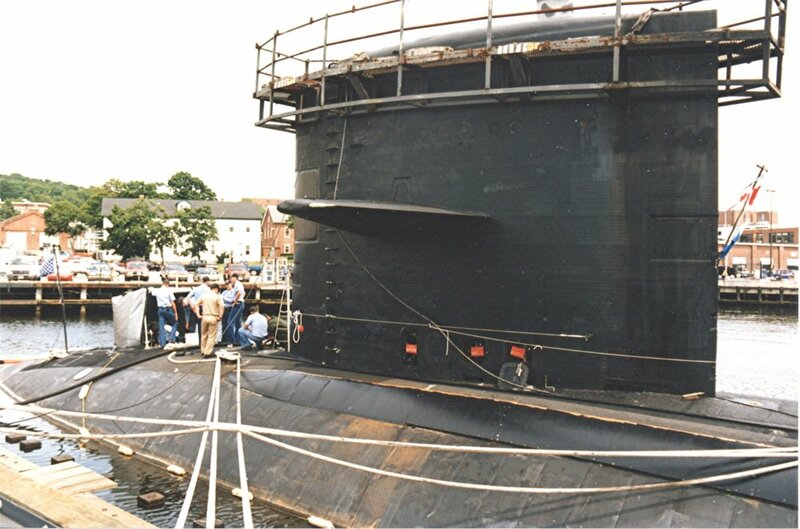 280k Starboard bow view of Archerfish (SSN-678), with DDS at pier 31 south, Groton, May 1995. Photo by Ken Hart. 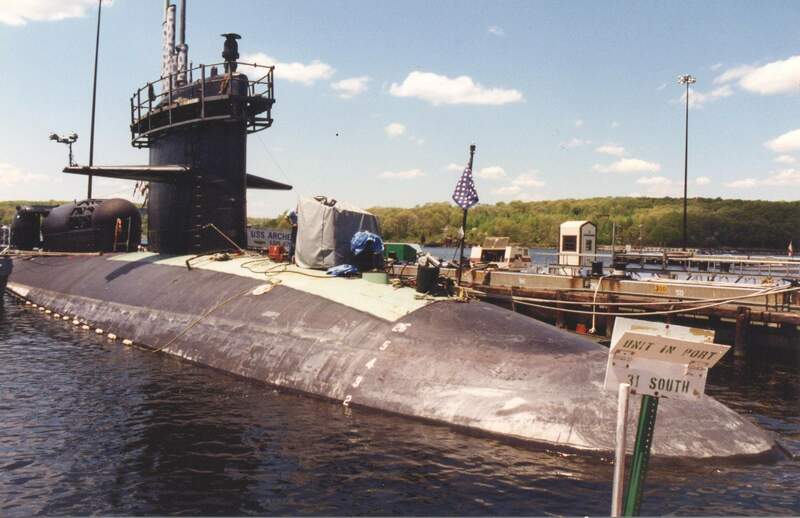 129k View of the sail of the Archerfish (SSN-678), May 1995. Photo by Ken Hart. 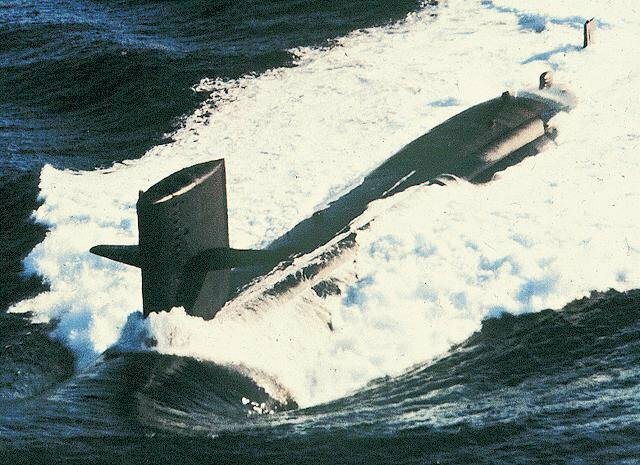 98k Close-up view of DDS on Archerfish (SSN-678) aft deck., May 1995. Photo by Ken Hart. 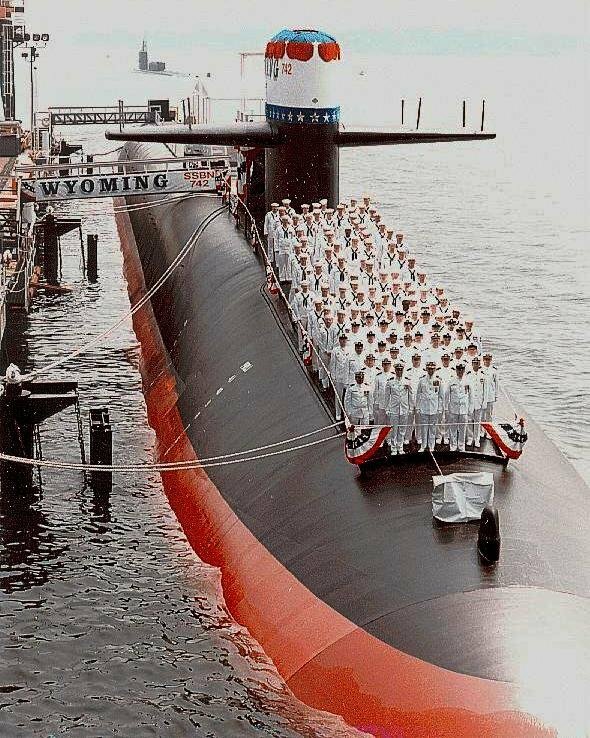 153k Wyoming (SSBN-742) commissioning ceremony, at the Electric Boat Division of General Dynamics Corp., Groton, CT., 13 July 1996. Note in the background the Archerfish (SSN-678) heading to the Mediterranean Sea for a six month deployment. 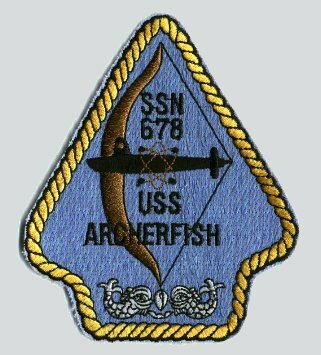 The Archerfish was home ported out of Groton and would work with Seal Team 2 deploying them from the DDS. Photo & text i.d. 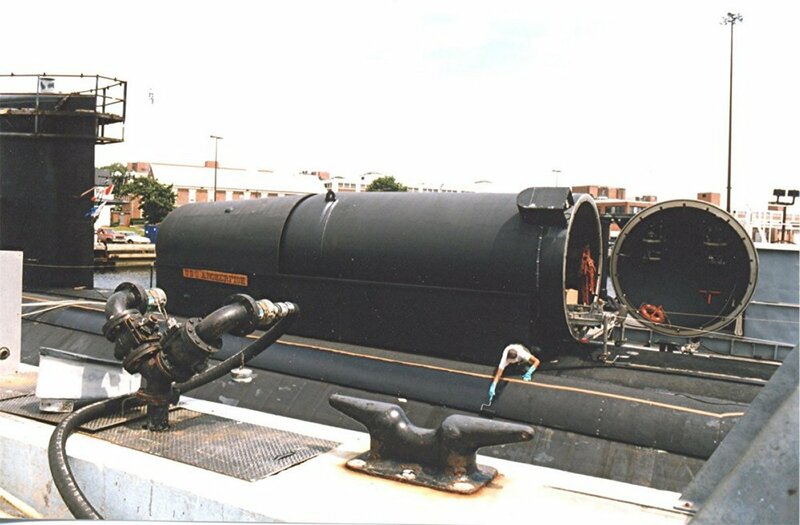 courtesy of Robert K. Montomery, MM2(SS) (Retired), SSBN 742 Plankowner. 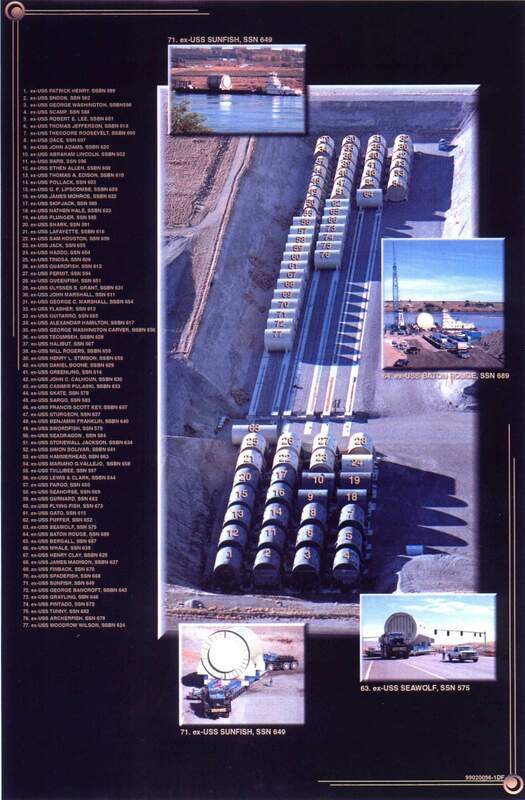 Electric Division photo now in the USN photo archives, courtesy of Federaltion of American Scientists. 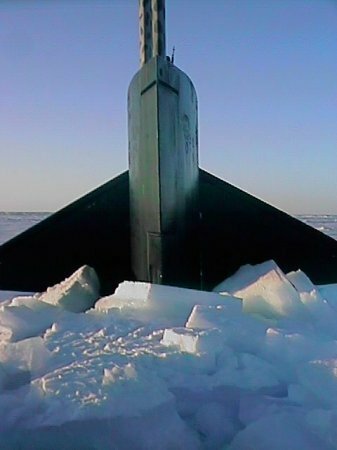 21k Archerfish (SSN-678), after breaking through the Arctic ice cap, 5 September 1997. 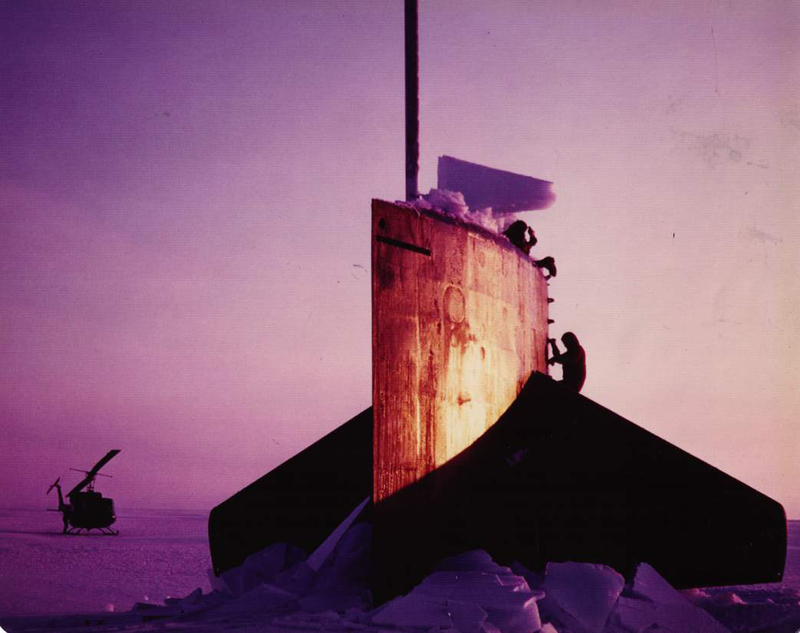 USN photo courtesy of the Arctic Submarine Laboratory. 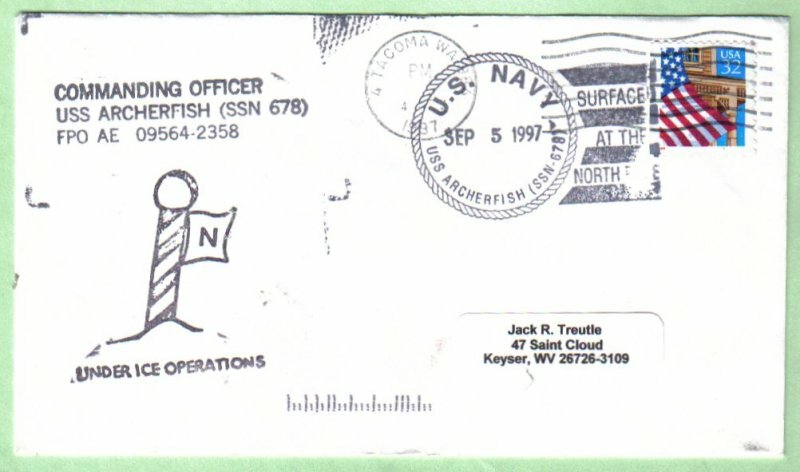 47k Commemorative post card marking the occasion of the Archerfish (SSN-678) breaking through the Arctic ice cap, 5 September 1997. Courtesy of Jack Treutle (of blessed memory). 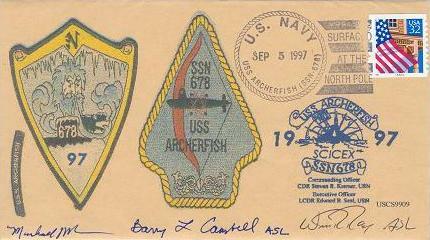 28k Commemorative post card marking the occasion of the Archerfish (SSN-678) breaking through the Arctic ice cap, 5 September 1997 during the SCICEX 1997 Expedition. Courtesy of Jack Treutle (of blessed memory). 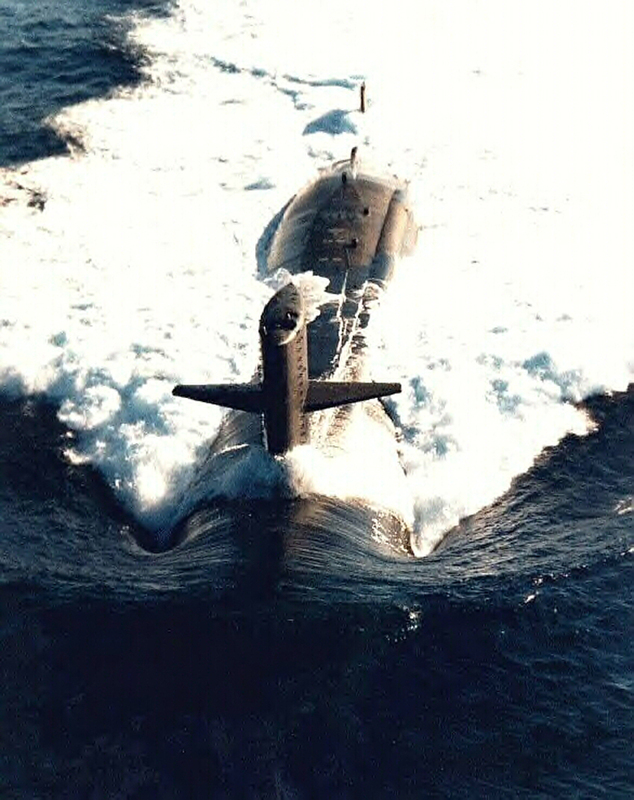 24k Archerfish (SSN-678) on the Surface during SCICEX 1997 Expedition. USN photo courtesy of the Arctic Submarine Laboratory & csp.navy.mil. 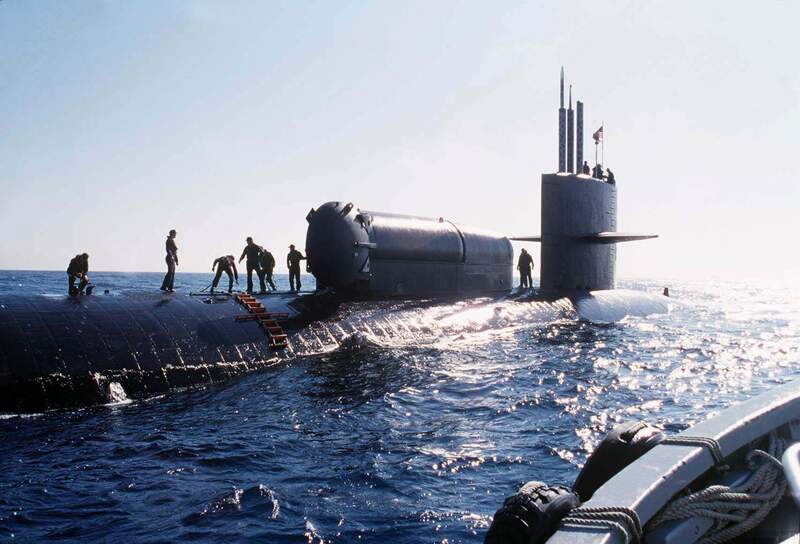 163k The U.S. Navy's nuclear powered Sturgeon Class submarine, Archerfish (SSN-678), prepares to transfer CNN media crews off the coast of Augusta Bay, Sicily, March 5, 1997. USN photo N-6135B-008 Lieutenant Barbara A. Burfeind, courtesy of csp.navy.mil. 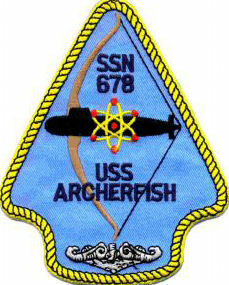 518k Archerfish (SSN-678) somewhere at sometime. USN photo courtesy of Scott Koen & ussnewyork.com. 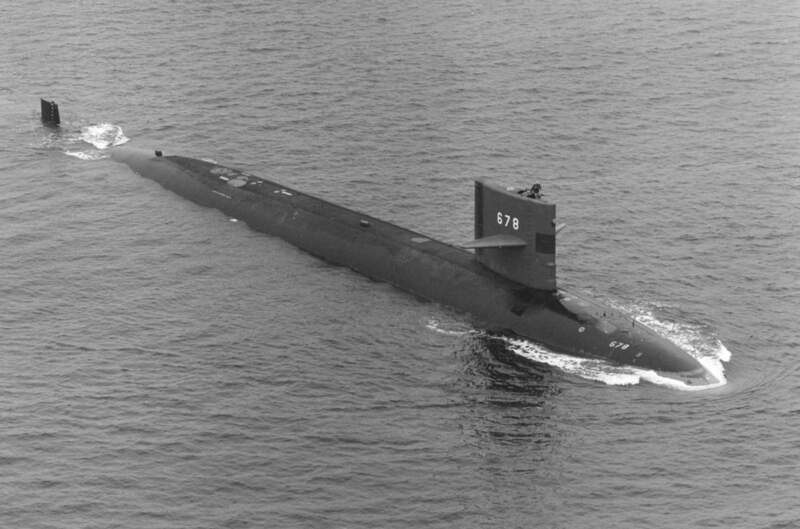 96k Archerfish (SSN-678), underway, date and place unknown. USN photo courtesy of the Federation of American Scientists.